HABIT: Low, compact annual for dry, extremely well-drained areas. USES: Summer color in full sun. NOTES: Always plant the dwarf varieties so they won’t droop over. Native to Madagascar. Many gardeners have stopped planting periwinkles because of the disease Phytophthora, but it can be avoided with the organic program. 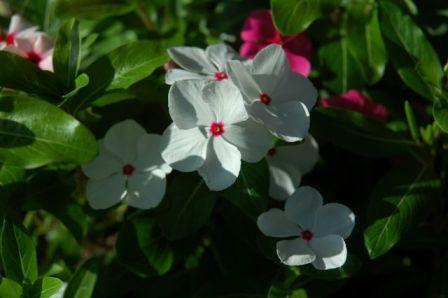 Periwinkles must be grown in full sun all day long and the morning sun is the most important sunshine of the day for plants.